Lawmakers, advocates and social media companies have been looking into ways to curtail online harassment in the wake of high-profile cases concerning cyberbullying and online threats. A January 2017 survey found that online harassment is a fairly common feature of online life: 41% of Americans said they have experienced some form of it, and among those ages 18 to 29, the share was 67%. A majority of the public – 79% – said online platforms have a responsibility to step in when harassing behavior takes place on their sites. Just 15% said these services should not be responsible for the abusive content users post or share on their sites. Americans’ views, however, varied by their political leanings. While around half (48%) of Republicans and Republican-leaning independents who were aware of the allegations said Russia was behind the cyberattacks, that share rose to 93% among Democrats and Democratic leaners. The 2016 election not only brought up concerns about cybersecurity, but there has also been widespread debate about the impact of fake news on social media – both in the presidential contest and beyond. Over the last year, social media companies have looked into new ways to address this issue. In a survey conducted in December 2016, 64% of U.S. adults said that completely made-up news had caused a great deal of confusion about the basic facts of current issues and events. And around a quarter of Americans (23%) said they themselves have shared a made-up news story online – either knowingly or unknowingly. Diversity, inclusion and discrimination have become major topics in and out of the tech industry. Self-reported data from several leading technology companies show that women, blacks and Hispanics are often underrepresented in this fast-growing workforce. 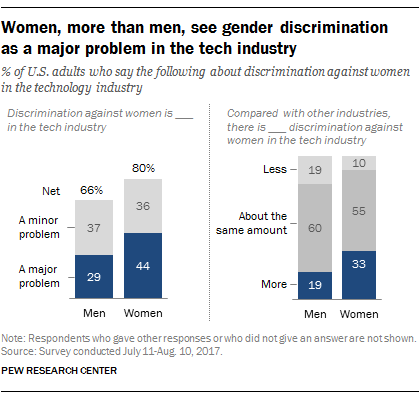 A survey this summer found that women are much more likely than men to say gender discrimination is a major problem in the technology industry (44% vs. 29%). And when asked about race-related biases, 64% of blacks and 50% of Hispanics said discrimination against blacks and Hispanics is a major problem in the tech industry. By comparison, just 21% of whites said this is a major problem. Automation has the potential to reshape many facets of American life, including how people travel from one place to another. A survey conducted in May found that a majority of Americans – 56% – were more likely to say they would not want to ride in a driverless vehicle. When asked why, the most commonly cited major reasons were a general lack of trust and safety concerns. Americans believe automation will likely disrupt a number of professions, but fewer foresee their own jobs being at risk. In a survey conducted in May, a majority of U.S. adults said it is at least somewhat likely that jobs such as fast food worker (77%) and insurance claims processor (65%) will be mostly performed by machines in their lifetime, while around half expected the same to be true of jobs such as software engineer and legal clerk. On the other hand, only three-in-ten workers said it’s at least somewhat likely that their own jobs will be mostly done by robots or computers during their lifetimes, including just 7% who said this is very likely. A small share of workers said they already have been impacted by automation. In total, 6% of U.S. adults said they have ever personally lost their job, or had their wages or hours reduced, because their employer replaced elements of their position with a machine, robot or computer program. The Federal Communications Commission voted in December to repeal net neutrality regulations put in place during the Obama administration. A Pew Research Center analysis of comments submitted online to the FCC about net neutrality found that during the four-month period (April 27 to Aug. 30, 2017) in which the FCC accepted comments on net neutrality, an average of 172,246 posts were submitted per day. Younger adults are using online streaming services as their go-to platform for watching television. 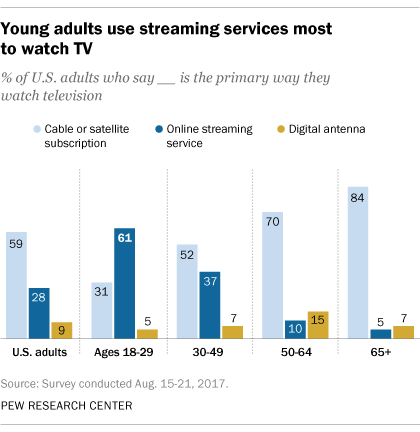 About six-in-ten Americans ages 18 to 29 (61%) report that online streaming is the primary way they watch television, according to Center survey data from August. Smaller shares of 18- to 29-year-olds said their primary way of watching TV is via a cable or satellite subscription or through a digital antenna. By comparison, older age groups were more likely to say cable or satellite is their primary way of watching TV. Some Americans are ditching their cable TV services altogether. A 2015 report by the Center found that 15% of U.S. adults were “cord cutters” – meaning they once subscribed to a cable or satellite TV service, but no longer do so.